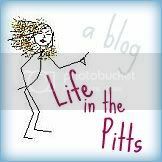 Life in the Pitts: Blood and guts are just not my thing. Usually. Haha, I'm not judging. I like zombie movies too! Zombieland is really funny... and gross. The first Resident Evil was soo much better. This one started out cool (the first part was pretty awesome) but went downhill from there. Also, Shaun of the Dead was funny. i actually bought that book for my stepdaughter while she was here this summer, then i bought her book #2 and will probably very soon buy the next, but to be honest, never even occurred to me to read it myself. that good huh? I love zombie movies! And after dragging my husband to see a few, he loves them now too. My favorite zombie movie quote: "Is everyone there dead? -- Well, deadish." 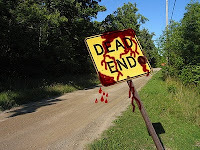 I loved zombieland, shawn of the dead and the 28 days later movies. I am really looking forward to the world war z movie that will be coming out. i will judge you-you are all weird. I HATE scary, gore, and bloody movies. They freak me out but somehow, Zombieland is my favorite movie ever :) I am going to buy it as soon as possible. You have great taste with that movie! OOoooh that book sounds fab! I am in the middle of Pride, Prejudice and Zombies and I love it. Sean of the Dead is one of my favourite movies. it is brilliant satire in my opinion, and a super funny zombie flick. Speaking of nightmares, zombies are my irrational fear ans so when I am stressed it manifests itself in zombie nightmares. Not so much the zombies but how we (family, friends and fellow survivors) band together and organize our efforts. Sometimes we win, sometimes I wake up before being eaten. so umm yeah, I like zombies too. LOVE zombie movies. Adding that book to my reading list. Where you been? I miss you.